Every person that I've ever met that's traveled to Cancun, Playa del Carmen, or anywhere in Mexico's Yucatan has raved about snorkeling in the cenotes, natural sinkholes resulting from collapsed limestone bedrock that exposes groundwater underneath. 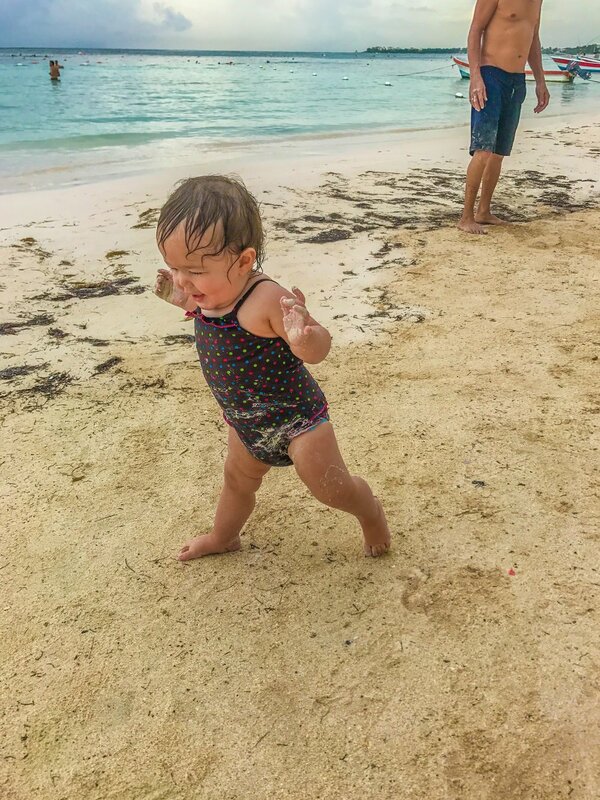 During a two-week trip to Playa del Carmen (one week with family and one week on my own), my 8-year-old nephew laughed giddily swimming under hundreds of stalactites in an underground cave and my 13-year-old niece jumped every time a tiny fish nibbled at her toe. Interestingly, these fish are also used in "fish pedicures" throughout the area and around the world, though the practice is banned in many US cities. I enjoyed swimming in the caves and jumping off cliffs at above ground snorkeling holes but the real highlight of the trip was scuba diving in the cenotes around Playa del Carmen. With the basic Open Water Diver certification, I was able to swim through underwater caverns and, with the help of flashlights, see massive stalactites, rock formations, and tree roots making their way down from the surface. We popped up into a few air pockets, one containing spiders and snakes that slither down from above. On sunny days, several cenotes offer breathtaking underwater views of sunlight piercing through the water and illuminating the life below. I enjoyed it so much that I completed my Advanced Open Water diver certification and plan to go back and complete a special cave diving course! During boat dives, 8-foot moray eels guarded shipwrecks and green and hawks bill turtles happily munched on seaweed, seemingly un-bothered by me shooting video of them with my GoPro. I would later drop my GoPro into the ocean while climbing into the boat (I slipped and the ladder knocked the camera out of my wrist mount). My dive instructor, Carolyn, immediately dove to retrieve it, swimming nearly 30 feet (10 meters). She had forgotten to put her regulator (breathing apparatus) back in and the ocean floor was nearly 100 feet at that point so I was really lucky to get it back. She earned a very good tip that day! Here is a recap of my favorite diving and snorkeling sites in the region. Note that I did not visit Dos Ojos, one of the most famous cenotes in the region. I've heard it has excellent diving but instead I opted for sites that had a greater variety of rock formations, air pockets, sunlight penetration, and submerged tree roots. I was very disappointed to not dive at Cozumel, the 2nd largest reef in the world, as storms and high winds kept the port closed nearly every day. This was, hands down, my absolute favorite dive in the region. The sunlight pierced through the bright turquoise water, illuminating the entire area and offering the most spectacular view I've ever seen underwater. Once arriving at the halocline, a zone in oceanic water where the salinity changes rapidly, the fresh and salt water mixed, causing blurred vision and mixed water temperatures. In order to see clearly and to get to warmer or colder water, I merely had to swim up or down a foot but I enjoyed swimming through the blur. Right next to the main cenote at Chac Mool is the "Little Brother" cenote, slightly less spectacular but also gorgeous and offering its own specialties. Half way through the dive, we popped up into an underwater air pocket, where a spider had crawled down. My instructor told me he had also seen snakes and other reptiles and small animals down there. Tree trunks puncture through the earth, into the air pocket, then back into the water. I'm normally not that impressed with wreck dives but this one was especially fun because the wreck was "guarded" by a gigantic 8-foot green moray eel and full of hundreds of small fish. The eel was standing up, making its normal opening/closing mouth movements right at the foot of the wreck, reminding me of 1980s video games where various creatures would guard the entrance to castles and ships. I learned that there is usually at least one eel at the wreck and often a couple eels sleeping or swimming around inside the bottom of the wreck. Watch out for the red fire coral and fire slugs inside! This dive site is very similar to Choc Mool, where sunlight and tree roots pierce through the water and an air pocket offers a nice resting point. 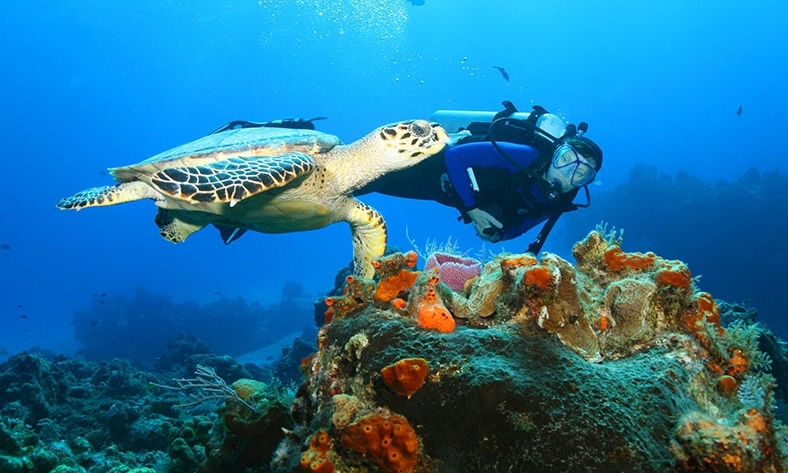 Akumal has been long known for great reef scuba diving and is also an excellent spot for snorkeling. It's a great location for a mixed group where some people dive and others don't. Turtles live near the shore and many turtle snorkeling tours in the area guarantee you'll see at least one turtle or you'll get your money back. My family had the bad luck of visiting the area after six days of rain so the visibility was very low but we still saw a few sting rays and one large turtle. Though snorkeling permits and guides aren't required, I would suggest hiring one if you're there on a poor visibility day, are a hesitant/weak swimmer, or have young kids with you (as I did), so you don't spend half the day snorkeling in circles. This site serves as a popular cavern and cave diving site as well as snorkeling and swimming hole. I did two dives here that were okay, but didn't rank nearly as high as other cenotes in the area. The snorkeling, however, is a great option for non-divers, as the huge cenote has low and high cliffs to jump off, making it good for all ages and fear tolerances. On the weekends, a lot of local families come out to spend the day swimming.